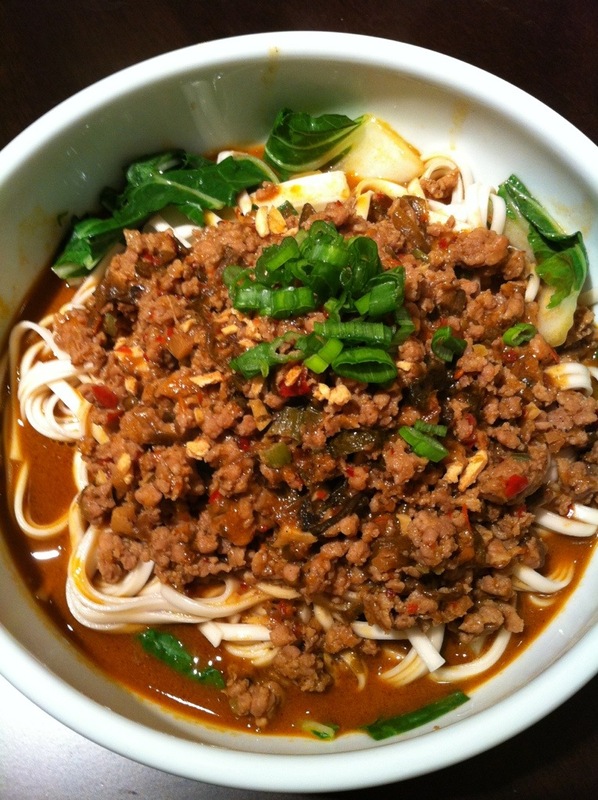 A few years back I posted a super simple recipe for zha jiang mian. I was in the mood for something spicier tonight and since it was already 8:30 pm and the hubby was hungry after flag football, whatever I made had to be quick and filling. I remembered that there was a new jar of toasted sesame paste sitting in my pantry so all we had to do was run to the store to pick up some bok choy and 30 minutes later, we were slurping down two bowls of hot and spicy dan dan noodles. The thing that I love about dan dan noodles is that you can change it up depending on what you’re craving at that particular moment. Tonight, it was chilly outside so I was in the mood for something extra spicy with earthy warm flavors. In addition to the basic ingredients, I added douban chili bean sauce, ground cumin and a few other spices. In the summertime, I like to make cold dan dan noodles with smooth peanut butter instead of sesame paste and garnished with cucumber slices. Below is my spicy variation of dan dan noodles. Combine all of your sauce base ingredients except the stock, peppercorn and sugar. Boil a pot of water and blanch your bok choy quickly (I like mine crunchy). Divide and place at the bottom of your bowls. Add the noodles to the same pot of water and boil until cooked. Drain noodles and divide into your bowls. Stove turned on high, heat up oil and saute ginger, garlic, and white parts of scallion for a few seconds. Add in the marinated pork, combine and cook until browned. Add in your pickled mustard greens and splash in the rice wine. Add in your sauce base and stir until all of the ingredients are mixed together. Pour in your chicken stock and 1/4 tsp of the ground peppercorn. Give it another stir. Wait for the sauce to boil again and taste it. The douban sauce is already salty but add salt if needed. I added an additional 1/4 tsp ground peppercorn but this might be overpowering for some people. Balance out the mixture with a pinch of sugar. Ladle the meat sauce over the noodles making sure each bowl gets enough broth. Garnish with chopped green scallion and fried garlic.